I started writing this post a few weeks ago, but life – in the form of a really nasty head cold – intervened and it was all I could do to get to work and home again. I knew I’d been under the weather when I realised that I hadn’t lifted a shuttle in weeks. Last post I wrote that my loom needed new cords and then for good measure my sewing machine and serger both needed new globes. I suspect my 1975 Elna which has made everything from underwear to tents is only on its third globe. It’s not that it hasn’t been used, it’s been used most weeks and has never missed a beat. I think it’s because changing the globe is such a challenge that it trains me to turn the light off as soon as I’ve finished sewing. I managed to get the old globe out with some difficulty and then managed to buy a close – 15 watt – but not exact – 25 watt – replacement. Getting the new globe in wasn’t going well as it’s a very restricted space and even my small hands were not small enough. Of course it took me a while to admit defeat and consult the book and I had forgotten the important step of putting a screwdriver in the hole on the top of the machine to push the whole lamp housing down. Once I did that and after several more attempts, the globe eventually clicked into place. It will take quite a while to forget how hard it was and by then I will have been re-trained to turn the light off when not needed. Fortunately the Bernina serger has a screw in globe and went in without any drama. 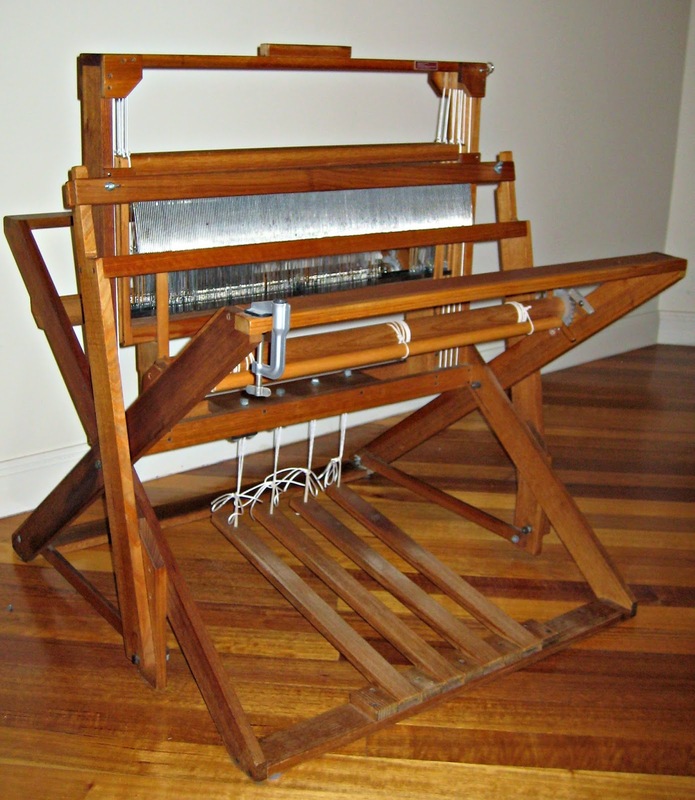 The 4 shaft loom now has new cords and a rub down with furniture oil. Getting the cords around the pulleys, 4 for each shaft, is a pain although this time I used venetian blind cord and it was much easier than the heavy cord I was replacing. I sealed the ends of the new cord on the gas jet on the stove and they were firm enough on the ends and still flexible on the rest of the cord that I could work them round the pulleys. Last time with the heavier cord I had to thread the curved upholstery needle with some strong yarn and sew it to the cord, thread the needle and the attached yarn round the pulley and then guide the cord through the rest of the pulleys. It took ages and a few days after I finished we had very heavy rain, so heavy that the drains blocked, water went into the ceiling and the plaster sheets started to come down. That was bad enough but the wet insulation all over the newly refurbished loom just added insult to injury. Here it is with new cords and a good rub down with furniture oil, I do hope there are no storms on the way. It was made here in Melbourne in the 1970s but it looks surprisingly like the Dorset loom, the predecessor of the Schacht's Baby Wolf, on Weavolution. I can’t say it’s a copy but I do wonder if there was a common ancestor somewhere. I decided to put just one last warp on the loom before I replaced the cords. I had a bag of mixed yarns, one of those treasures from a workshop, a guild meeting or live in course where someone had cleaned out their studio and made up bags of leftovers to be sold for a worthy cause such as guild funds or scholarships to help textile students attend the event. 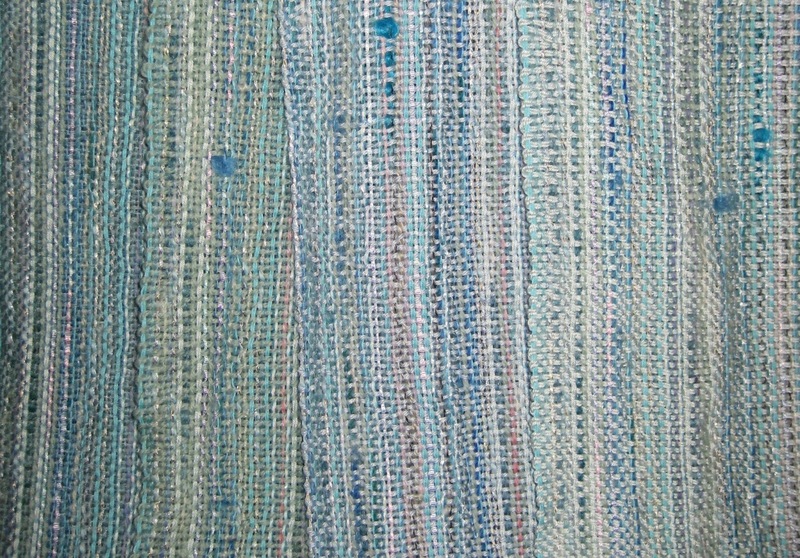 All the yarns were in shades of pale aqua and I knew I would have plenty in similar colours at home to add to the mix. There was enough for warp for 4 scarves and weft for one, some of the recycled wool and silk from the wardrobe clear out was the next weft and I bought a couple of balls of knitting yarn for the other two. As I wove them they reminded me a lot of the glaciers I’d seen on the West coast of New Zealand on a trip years ago. 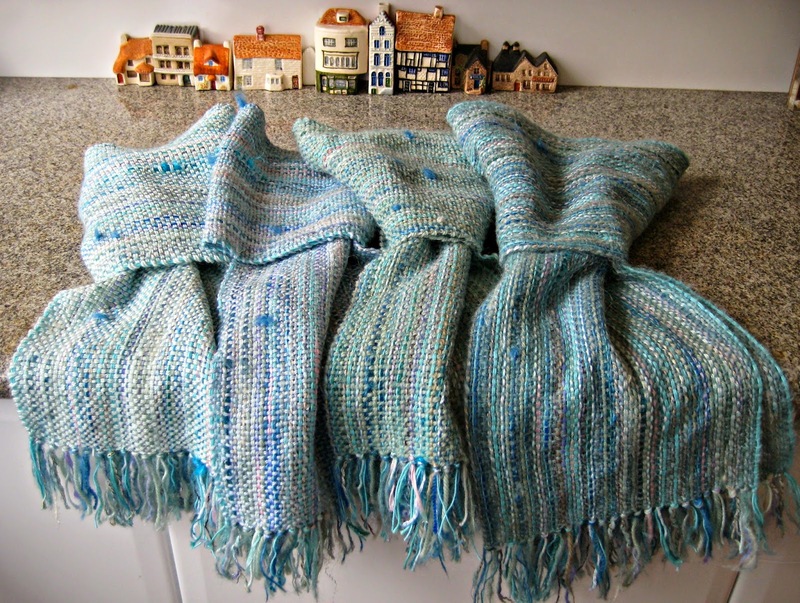 So here are my 4 plain weave glacier scarves, whipped up from a mystery bag of leftover yarns, a few yarns from the stash and a couple of balls of knitting yarn, and all posing in front of the village of miniature china houses at the back of the kitchen bench. Below, from left to right the wefts were mohair from the mystery bag, sage green knitting yarn, blue recycled 60/40 wool silk and pale aqua baby acrylic and wool. Time to get ready for the Hawthorn Craft Market on Sunday, at least we’re inside, it’s no fun being outside in the middle of a Melbourne winter.